The contemporary romantic dance musical La La Land continues to post strong earnings at the box office, generating $40 million domestically and $68 million worldwide (double its production budget). The film is destined to generate much more as a Golden Globe nominee and potential Oscar contender. I will be surprised if the film fails to bring home a major award. 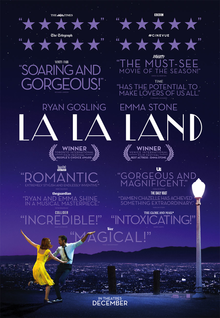 Written and directed by Damien Chazelle (Whiplash, 10 Cloverfield Lane), the plot follows the two aspiring artists in Los Angeles—Sebastian (Ryan Gosling), a jazz pianist unwilling to compromise on the purity of his art, and Mia (Emma Stone), an aspiring actress who finds the rough and tumble world of Hollywood dispiriting and overwhelming. The characters are well developed, and their arcs are clearly defined over the course of the story. Sebastian’s intransigence in the face of pressures to bow to bland public musical tastes is artfully depicted in a scene in a lounge (managed by the reliably excellent J.K. Simmons) where he is fired for straying into free form jazz rather than remain focused on the uninteresting background music he was hired to play. His unwavering commitment to art nearly leaves him destitute but secures the admiration of Mia through a serendipitous meeting in the lounge. La La Land incorporates much of Chazelle’s hard earned experience, as well as that of Gosling and Stone, into its scenes, giving the film a gritty realism while effectively driving the plot. For example, Mia is performing a heartfelt line when one of the casting director’s takes a personal call, an event borrowed from Gosling’s own auditioning experience. The callous nature of Hollywood and the film industry, as well as the idolatry that draws so many into it, is captured well through these small vignettes which increasing drive Mia to a breaking point when she stakes her savings and professional aspirations on a one woman show. Chazelle’s story masterfully plays off the differing paths of the lead characters as it builds to the climax, a penultimate point that challenges the characters’ commitment to themselves and their art. But the weave of the story is much more complex than a simple clash of futures or paths. One of the more innovative techniques Chazelle uses reels back through time to chart different courses for the characters at key plot points. This begins at the outset of the film when the characters are introduced after a grand dance number choreographed on an LA freeway so congested traffic has come to a stop. But the technique is used several times to convey different outcomes, allowing the audience to internalize the storytelling technique while pondering more substantive questions about decisions and relationships. This becomes crucial for the film’s climax, bittersweet third act that focuses on the emotional and professional state of the characters to highlight what is ultimately a story about the choices we make and the personal consequences of those decisions. The film is grand and soaring, much like the most audacious mid-twentieth century musicals, but the story is more complex and artful than many of the classics. Drawing inspiration from classic musicals, including Singing in the Rain and the Umbrellas of Cherbourg, as well as performances by theatrical numbers by Fred Astaire, Ginger Rogers and others, Chazelle has crafted a film that plays homage to this bygone film genre as well as the real-life experiences of those trying to make it in today’s film industry. La La Land is distinguished by its production values, ability to entertain, and financial success as a contemporary musical. More interestingly, Chazelle’s determination to tell a complicated story adds to the richness of the film, giving his experienced actors the freedom to explore their characters and relationships. The ending will not be satisfying to many, but this is also his point: real life involves choices and meaningful trade-offs. Our decisions about which choices to make lead to different outcomes, and the results may not be completely satisfying even as we accomplish our professional goals. This entry was posted in Characters development, Film Reviews, Films, writing and storytelling and tagged Damien Chazelle, emma stone, film reviews, La La Land, musical, ryan gosling on January 6, 2017 by SR Staley.